What is Prime Time all about? Prime Time Preschool will provide your child with a positive first school experience - the first step. Our program is geared toward helping children develop the ability to observe, question, and listen. It gives them an awareness of their own feelings and their right to express those feelings in an appropriate manner. Prime Time encourages positive self-esteem through independent decision making. They learn that they are free to make choices, as long as they stay within the limits of consideration for people and things. An individualized program like ours prepares children to utilize their intellectual and creative abilities in future learning tasks. A unique aspect of Prime Time is the ratio of staff to students. Three caring teachers will staff each class of 20 students. Our program allows for an ongoing consistent relationship with the children. Prime Time also emphasizes communication between parents and staff. This is accomplished through parent-teacher conferences, monthly newsletters, and detailed activity calendars. 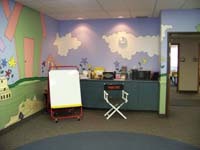 Prime Time Preschool was established in 1992 and opened in the Fall of 1994. The co-founders of the preschool were Lynda Schoonover, Deb Kirchen, and Beth Cook who worked together at a preschool in Lansing called Sunshine House. 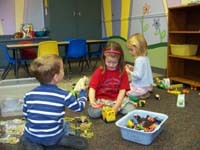 At that time, play-based preschools were not readily available in the DeWitt area. It was felt that with using the model of Sunshine House as a guide, a quality preschool experience could be provided for DeWitt-area families. At the same time, Redeemer United Methodist Church was beginning a building expansion project. The preschool was fortunate to be included in the planning for the classrooms in this building expansion which now houses the preschool. It has been a cooperative effort of families, friends, and staff to ensure the long standing continued success of the preschool.